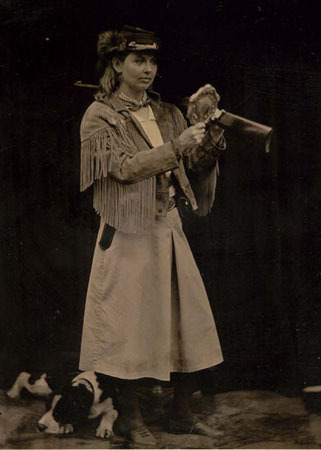 "She was said to be the daughter of Annie Oakley, even though the real Annie (married to Frank Butler, also a trick shooter) never had childern. We gave her a vintage type military hat to wear because a western hat didn't seem appropriate for a show on the east coast. Actually, I understand that Buffalo Bill wintered his show just ten miles from where we lived in Pennsylvania. France had (still has) a really nice early 22 caliber rifle that had the lines of a much more serious gun. She also used a very small, brass bound 32 caliber cap and ball pistol with real ivory grips which she could twirl. The little girls really looked up to her character....as did the older men. The tintypes of me and my wife were made at a fair. Claude Levet, the tintypist, was set up across from our stage and made them without charge...it was a very hot and slow day. We had gotten married just the week before."